This source is a clearinghouse of scientific information about the Yellowstone volcanic system. Topics include recent seismic and thermal activity, volcanic history, references and maps, a photo gallery, and FAQs. 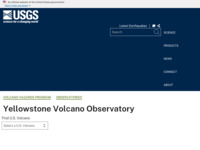 This website contains both general information that would be useful for anyone that is seeking information on the Yellowstone volcanic system, as well as more specific resources for geology students or teachers.